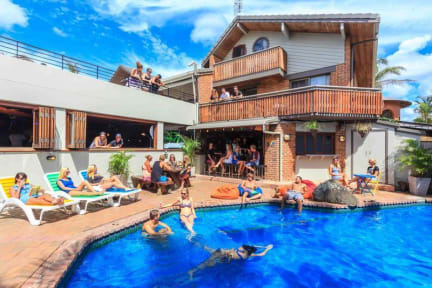 Aquarius Backpackers Byron Bay i Byron Bay, Australien : Boka nu! Super nice hostel with a Good atmosphere and an amazing staff! Would recommend 10/10! Allt som allt var hostelet väldigt bra, nära stranden och bra stämning. Man fick även gratis kvällsmat vilket var guld!!! Vi bodde i ett 10-dorm där vi alla delade på ett badrum med dusch vilket var lite jobbigt... annars ett superbra hostel. Nice ställe. Gratis middag varje dag och du får byo. Däremot var sovsalarna helt ok rena, trånga och alltid upplåsta.. I köket fanns det inte speciellt mycket grejer heller. Spacious dorms! Not very clean bathroom even though they cleaned it everyday. The kitchen was also cleaned every morning but people didn’t put away their dishes so it became dirty during the day. Nice chill areas outside! Ok hostel, not too far away from the beach and shops. Nice with free dinner and good prices at the bar. Rooms and toilet were a bit dirty and felt unsafe because there were two doors in the room that were constantly open and anyone could walk in. People were loud coming in at night and woke the whole room up. Had to sleep under the stairs so dirt got all over me when people used the stairs. Only outlets by the sink, not close to the beds. Nice staff though and fun with quizzes at night.